Review our verdicts & testimonials page. Helpful information about your case. The Rubinstein Law Group has fought for the rights of accident victims throughout North San Diego County, including in San Marcos, Oceanside, Carlsbad, Vista, and Escondido, for the past 30 years. Mr. Rubinstein founded The Rubinstein Law Group in 1988 to provide exceptional legal representation to accident victims struggling with serious injuries. He is committed to providing the personalized service you deserve by handling every aspect of your case from the initial consultation to the final verdict or settlement. This means that he does not delegate important aspects of the case to less experienced associates or paralegals. He is committed to responding to client phone calls and emails within 24 hours, and keeps his clients' best interests as his top priority. If you were injured in a car accident, a slip and fall, or another accident in the San Marcos, Oceanside, or Escondido areas, consult personal injury attorney Zev Rubinstein for guidance and advocacy. He is a member of the Multi-Million Dollar Advocates Forum, which consists of personal injury lawyers who have won settlements and verdicts in the millions of dollars. When you are traveling on I-5, I-15, I-78, or any of the other roads in North San Diego County, you may be involved in an unexpected accident. To prove another driver’s liability for the crash and your injuries, you would need to show that the at-fault party drove unsafely and that you were hurt as a result. All drivers are legally required to operate their cars safely and to follow safety laws and regulations. Unfortunately, however, common unsafe behaviors such as drunk driving, texting while driving, failing to obey traffic signals, failing to yield, speeding, or tailgating can result in serious injuries to accident victims. A victim who successfully establishes the liability of an at-fault driver usually can recover economic and non-economic damages for their injuries. These may include the costs of their medical care and any future treatment that they may need. Damages also may cover lost income and earning capacity, property damage to the vehicle, and the victim’s pain and suffering. In some cases, expert witnesses may be useful in proving the extent and impact of a victim’s injuries. Retaining an experienced attorney who can gather evidence on your behalf and present it persuasively is critical to getting a fair settlement or verdict. While there are some similarities between car accident and truck accident cases, there are also some key differences. One distinction is that truck accidents often result in the liability of not only the driver but also the trucking company. This can be established either indirectly or directly. Indirect (or vicarious) liability arises from the idea that an employer is responsible for the actions of an employee while they are on the job. It does not depend on showing that the employer acted carelessly. On the other hand, direct liability involves showing that the employer was careless in its failure to exercise proper hiring, training, and supervision of the driver. For example, a San Marcos personal injury attorney might be able to show that the company failed to properly train or supervise its drivers, or perhaps it ignored red flags in the hiring process, such as a record of DUIs. Contrary to what some drivers seem to think, motorcyclists have an equal right to use the road. They are more exposed to the elements than people in cars and trucks, which makes motorcycle accidents especially devastating. Drivers and insurers often are reluctant to provide fair compensation to an injured rider. They may claim that the motorcyclist caused the accident, at least in part, to avoid or reduce liability. The comparative negligence rule in California provides for a reduction in the injured victim’s compensation if they were partly responsible for causing a crash in San Marcos, Oceanside, Escondido, or the surrounding cities. However, they still may be able to recover compensation that is proportionate to the driver’s fault. Zev Rubinstein can look into the circumstances of your accident and help you make sure that an at-fault party is held liable to the appropriate extent. The construction industry is notoriously dangerous, yet the entities in control of these sites often fail to respect worker safety. An injured employee can pursue workers’ compensation benefits from their employer after a construction accident, but this may not be their only remedy. Depending on the cause of the accident, a victim may have a third-party personal injury claim against a general contractor, a property owner, a manufacturer of defective equipment, or another defendant. This may allow them to receive damages that go beyond the benefits that the workers’ compensation system provides. In contrast to a workers’ compensation claim, a personal injury lawsuit requires proving fault. Thus, it is critical to retain a personal injury lawyer in the San Marcos, Oceanside, or Escondido areas to understand and assert your rights. Slip and fall accidents and other accidents on property often lead to premises liability claims. In addition to establishing the property owner’s negligence, an injured victim will need to show that the at-fault party knew or should have known about the dangerous condition that caused the injuries. For example, if you fall off a rotting balcony of a hotel and break a leg, you will need to show that the hotel knew or should have known that the balcony was rotting. If you slip and fall in a grocery store, you will need to show that the grocery store knew or should have known about the liquid that caused the fall. Usually, a property owner should know about a dangerous condition when it exists for a long duration. We can help review the relevant evidence and retain experts as needed to establish notice and causation in a premises liability case. In certain situations, you may be able to recover damages under a theory of strict liability rather than negligence. For example, there is a strict liability rule that makes pet owners responsible for dog bites. It does not matter, in other words, if an owner knows that a dog has ever previously been vicious. You can hold a dog owner strictly liable if you were bitten by their dog, and the bite happened in a public place or a private place where you had a right to be. For example, if you were delivering mail and were bitten by a mail recipient's dog, you could hold the owner strictly liable. Our San Marcos personal injury lawyer can help you bring a claim for compensation if you are dealing with the injuries and trauma caused by an animal attack. Sometimes an injury results from a defective product. In that case, you may be able to recover damages through a product liability lawsuit against the manufacturer of the product. There are three types of actionable defects: marketing, manufacturing, and design defects. A marketing defect usually involves a failure to warn. For example, a drug manufacturer that fails to warn doctors about the serious or fatal side effects of a medicine can be held liable. By contrast, a manufacturing defect is a problem that affects a specific item or group of items because of a one-off mistake. A design defect affects every item in the line because there was something unreasonably unsafe about the product’s intended design. When a loved one dies because of someone else’s careless conduct, you may be able to file a wrongful death claim against that person or entity. Wrongful death cases can arise in the context of motor vehicle accidents, dangerous property conditions, or defective products, among other situations. The context of the death may determine whether you can recover damages and what you need to prove. 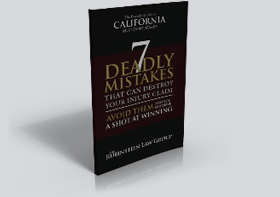 For example, if your loved one died in a nursing home in San Marcos, Oceanside, or Escondido as a result of the staff's negligence or abuse, you may be able to bring a lawsuit under common law principles of negligence, and you may also have a claim under the Elder Abuse and Dependent Adult Civil Protection Act. Like personal injury claims, wrongful death actions must be filed within a limited time period after the accident. As a result, you should promptly seek legal counsel if you are considering this type of claim. If you have gone through the devastating experience of a serious accident, you should not hesitate to get an aggressive attorney on your side to fight for your rights. Zev Rubinstein is ready to work tirelessly to assist you with every aspect of your recovery, from helping you obtain appropriate medical treatment to helping you secure the compensation to which you are entitled. He understands the challenges that victims and their families face on physical, emotional, and financial levels, and he will treat you with the compassion that you deserve. For a free consultation following an accident in San Marcos, Escondido, or Oceanside, call 866-771-7181 or contact us online.